The SAP component or support package contains a lot of corrections, improvements and new functionalities which is delivered by SAP. Each support package is valid for specific release and valid for all types of operating systems and databases. The SAP support package manager (SPAM) ensures the support packages are imported only in the specified order. SAP recommendation is to update the SAP system at regular intervals to prevent the errors. SPAM/SAINT Update: This should be latest version in every system before executing the actual upgrade. This contains updates and improvements to the Support Package Manager and the SAP Add-On Installation Tool. Application Components or Support Packages: A Component Support Package (CSP) is valid for one software component and contains quality improvements for Repository and Dictionary objects in this software component only. Conflict Resolution Transport (CRT): is exclusively used for add-ons, for example, IS-H or IS-OIL. It is used to adjust Support Packages for an add-on. Below we can see the list of SAP components used in R3 systems. The SAP Components is nothing but a list of relevant support packages installed in the system based on its product version. 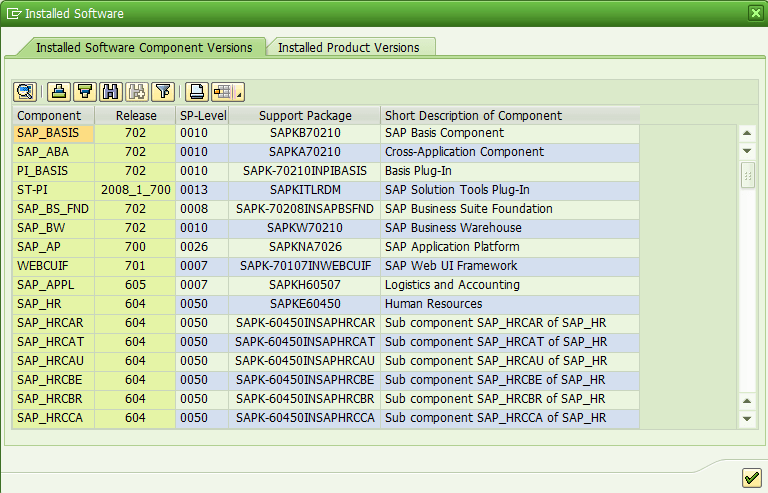 SAP components list is vary from system to system and based on its product like ECC, CRM, SRM, XI/PI. Java systems components are differ from R3 systems, below SAP Components list is only from ABAP side. Additionally we also see some another components from SAP which is called as addons. Add-on is a special component which need to be installed separately based on the requirement from business. In some of the customer systems we can also see some third party components. Thanks for posting all SAP components.